( Gabriel Ghavami @ Business 2 Community) 40% of your customers visits your website via a mobile phone. Every business should look for unique production, top-quality solutions and implementation of the mobile web. 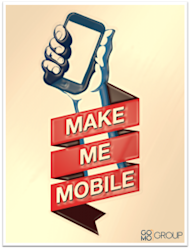 How does it work when mobile suits your website? The mobile website exists parallel to your current website. A mobile website detects if the user enters via a cell phone and automatically loads a mobile page instead of the regular website. Mobile experts (like GO MO Group in Sweden) have the ability to deliver cost effective, high quality and advanced solutions to the customer. All quality control is directly associated with the production. Europe is facing major changes. The consumer already has heavy demands on corporate mobile accessibility and customization. We have identified a great need, where the business market is looking for expertise to help companies take advantage of the rapid developments taking place in mobile media. Why a custom mobile website? Mobile website or mobile site, is the name of a website that is optimized in both layout and content for use via a mobile device. Yet another reason to get a mobile website is that many so-called “Smart phones” with a web browser do not support flash files, i.e., that the website does not appear at all in the mobile search. This past Christmas, 48 percent of Smartphone owners used their phone to locate a suitable Christmas present, an increase of 9 percent compared to last year. A third also used their cell phone to then complete their Christmas shopping. 17 percent of Smartphone owners say that they are likely to spend more money from their mobile devices next Christmas. Another 31 percent said they would consider it if the dealers are working more to make the shopping experience quick, easy and as seamless as possible. Of those who shopped via mobile phone, only 24 percent are completely satisfied with the shopping experience. E-merchants simply have little to work with it when it comes to customizing shops to mobile visitors. It is, however, an increase of 6 percent compared to last year, suggesting that the mobile is moving in the right direction.